This weekend provided a great example of what our newspape rs should be doing in holding our government accountable. In an article on July 14, they examine the Oregon Healthy Kids program that was formed in 2009 to address the presumed crisis of 100,000 plus uninsured kids in Oregon. The program was funded, of course, by a new tax - a 1% tax on commercial insurance policies, set to expire in 2013. Of course it was met with federal matching funds, so the combined budget was roughly $130 Million, plus performance bonuses. Healthy Kids director Cathy Kaufmann says the program serves as a model for the changes ahead. And that her office remains key to the state's goals. "It should be easy for us to reach out now and enroll their parents too," she says. Kaufmann characterizes the program as an unvarnished triumph, and Healthy Kids has made it easier for more than 100,000 low-income kids to sign up for state-funded insurance. and Healthy Kids compared disparate studies improperly, exaggerating its success. Healthy Kids vowed to sign up 80,000 kids by the end of 2010, and did. Since, enrollment numbers have swelled further for a net gain of about 110,000. To pay for the gains, the federal government awarded Oregon more than $30 million in performance bonuses. But signing up low-income kids was just one goal of Healthy Kids. A major selling point was extending insurance to middle-income children as well. Three years in, this push -- called Healthy Kids Connect -- has signed up about 6,000 children, compared to the 34,000 the state initially projected. The state contracted with private insurers to offer the Healthy Kids Connect policy, for a subsidized rate of around $35 to $50 a month; families of four could earn between $44,000 and $66,000. More affluent families pay full cost, which runs as much as $475 per child per month. This was the truly new part of Healthy Kids. When Kaufmann was hired, a major goal was boosting enrollment "especially in Healthy Kids Connect," according to an auditor's interview with her last year. Now, Kaufmann blames cost -- even of subsidized coverage -- and also suspects uninsured middle-income kids dropped into poverty during the recession. Auditors, however, found the state's bonus application improperly included children from the Citizen Alien Waived Emergent Medical program, a federally required program for emergency-only medical services to certain non-citizens. [State Audit Director] Blackmer's audit was prompted by a phone call raising concerns about the program. A draft copy of the audit was obtained under Oregon Public Records Law. While the draft said that financial controls of the Healthy Kids program "generally" did a good job of ensuring its money was well spent, auditors' work papers initially called fiscal controls "weak" and "inadequate." Blackmer said the audit dropped the stronger language because the program followed state contracting rules. However, the audit did question aspects of Healthy Kids' spending $1.8 million of its $13.2 million administrative budget on advertising. Reviewing 77 out of 1,586 advertising buys, auditors cited 18 examples in which Healthy Kids did not properly document spending. In one case, the state paid $10,000 to an advertising company without a contract, and in 11 others state officials could not provide sufficient proof vendors had placed the ads. One vendor was paid twice for the same ad, costing $541. In order to get the bill passed, private insurers were promised much more robust activity in this program to defray the impact of this new tax. The article reveals that insurance executives are obviously very disappointed in the results of enrollment - and that the enrollment was entrusted to several non-profit organizations that subsequently were removed from or resigned from the program due to underperformance. These nonprofits may be hitting a point of diminishing returns, says Sandra Peterson, a recently retired Multnomah Education Service District official who worked with Healthy Kids. Her read of school statistics indicates the bulk of African American children in Multnomah County are insured. A 2010 Census Bureau survey supports that. It counts only 253 uninsured African American kids in the county. Perhaps the biggest problem with measuring this program's success comes in the actual counting of the before and after numbers of uninsured kids in Oregon. While the numbers of kids on state-funded insurance has climbed significantly, Healthy Kids has exaggerated its impact on the overall rate of kids' insurance, whether state or private. At the start in 2009, a U.S. Census Bureau survey estimated 104,000 Oregon kids were uninsured, or 11.3 percent. Healthy Kids officials promised to cut it to 5 percent. Their news release declared victory last year: "Healthy Kids Program Cuts Percentage of Uninsured Oregon Children in Half." It reported 52,000 kids or 5.6 percent uninsured. The press picked it up, and Health and Human Services Secretary Kathleen Sebelius repeated it. The claim, however, skews the statistics, according to experts and to state documents. While the 104,000 number comes from the federal census survey, the figure Healthy Kids cites to claim success comes from a state-funded survey with a different methodology, which experts say likely led to the lower estimate. The program may be even more of a sham than the article indicates. On his radio show this morning, Jeff Kropf pointed out a failing in the baseline assumptions of the program. He reports that he asked state representatives a year ago if the program had any way of measuring whether the program was adding children who were previously insured under their parents' private plans, or whether the program was exclusively reserved for previously UNinsured kids. The answer was that the state wasn't tracking this variable. So in other words, an incentive was created for parents to save money by moving their kids to government subsidized plans, and the Healthy Kids program is incentivized to accept these kids to show greater success than they actually achieved. 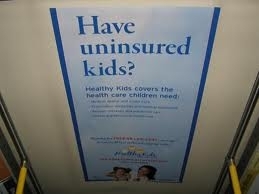 We have no way of knowing if the new 110,000 kids on this program were truly uninsured before being on the program. This program was created when the state legislature was presented with a crisis - we have an epidemic of uninsured children in Oregon. This crisis, we were told, required immediate governmental intervention to correct a problem that only government can fix, and it's for the children. But as typically happens with new bureaucracies created in crisis (you have to pass it to see what's in it), the emotions of the moment trump logic and need. This was compounded by the promise of federal matching funds (Free money from the sky! We have to create the tax to get the federal money!). Given the unwillingness to account for all variables, the inability to accurately measure before and after numbers, the underperformance of the nonprofits that were tasked with getting these desperately needy children enrolled, and the massive amount of money wasted on relatively few enrollments, the very idea that this has been a success flies in the face of logic and facts. As a commenter put it on the electronic version of the audit story, "Every time someone bothers to look for waste, fraud and abuse in Oregon government spending, they find it."